Belle Fourche Farm started breeding Dexters in 1988. We were fortunate to acquire some very nice foundation stock when the owner of the Rio Grande Herd in TX retired and decided to travel. This herd had been focusing on small sized, proportionate (non-dwarf) animals, which was exactly what we wanted. By maintaining more than one bull, and using artificial insemination to our past bulls, we have tried to maintain the herd’s uniformity while maximizing genetic diversity. 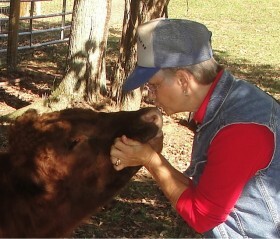 We have also been able to pair cows with bulls that best complement their traits. Our herd was largely built around a cow named Sooner P-Bar Sparkle, a lovely cow with great width and depth, good feet, and a well attached udder. 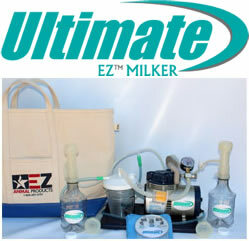 Hillview Dexters was founded in 1993, starting with stock from the Belle Fourche herd. The herd was largely built around a cow named Belle Fourche Sparklett. She was a daughter of Sooner P-Bar Sparkle and Belle Fourche William. William passed on his distinct look and smaller frame, (similar to the descendant of William in this photo). And, William’s dam had a perfect udder. The Hillview herd took a somewhat different route by using mainly British bulls by artificial insemination for the first 5 years. The herd then began keeping its own bulls that were a mix of British and American bloodlines. Eventually, the two herds (Belle Fourche and Hillview) merged, and both became Belle Fourche. The founder of the Hillview Herd passed away this July at 102 years of age. She was still involved in the selection of breeding stock. A polled daughter of Belle Fourche Sparklett went on to become the foundation cow of the Emerald Park herd in Washington. This Hillview cow, HV Saltaire Susie, is the dam or granddam of some very influential bulls in the Dexter breed; Hillview Red Wing, Belle Fourche Mr. Right, and Mrald Overture. Belle Fourche Mr. 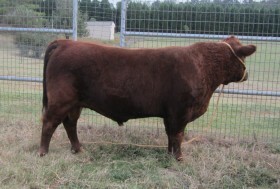 Right and Mrald Overture have also gone on to produce calves in Europe, South Africa, Canada, and Australia. In order to maintain genetic diversity, while retaining a consistent breeding program, the Emerald Park and Belle Fourche herds trade stock every year or two, which requires animals to be shipped nearly 2,800 miles. The quality of the Dexter breed has suffered from a long history of breeding animals as pets. Our program is focused on feet, legs, and udders; the three categories that will shorten an animal’s productive life when conformation is overlooked. We have also focused on creating animals with better rear-end conformation, hook-to-pin length, and more hip. We have one of the most intensive polled programs in the Dexter breed, so virtually all our stock is born without horns. 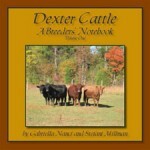 We have also bred out both Dexter genetic lethals from our herd. (The entire herd is chondrodysplasia and PHA free.) 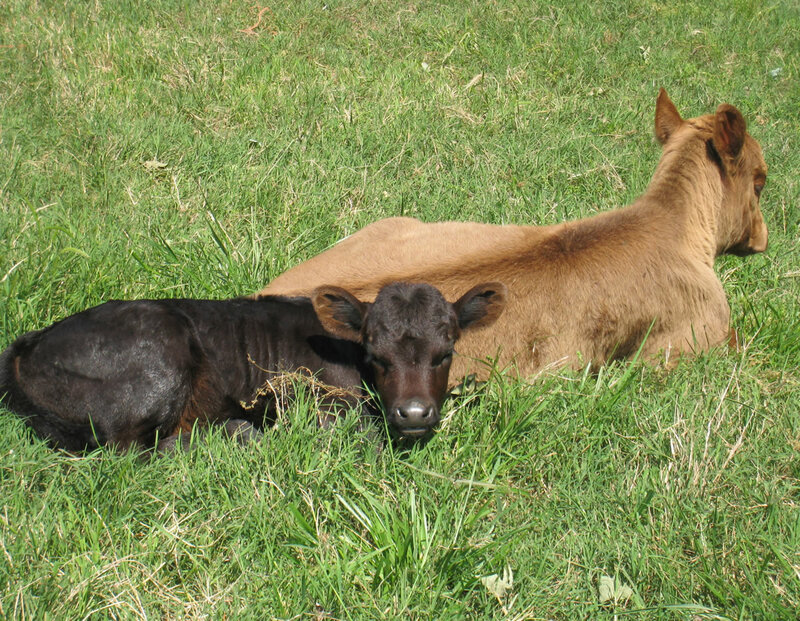 The Belle Fourche herd is known for producing animals with a calm, friendly nature, and reasonable attitude. 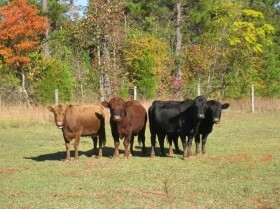 We are not focused on color, but do have all three colors (black, red, and dun) in our herd. Our breeding goals have remained very similar to what they were in 1988; small proportionate animals with good udders, good dual purpose characteristics, and gentle dispositions; the ideal family cow. After more than 25 years breeding for these goals, we have created a very consistent herd. Along with our breeding goals, we also strive to maintain a good management program. Our herd is tested for BLV, BVD, and Johne’s and any incoming cattle are determined to be negative before entering the herd.